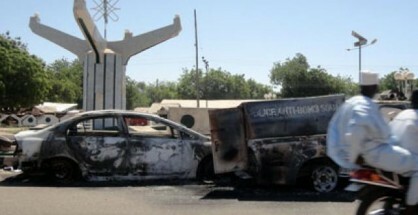 The Yobe state government has imposed a 24 hour curfew in Damaturu, the state capital. This followed the intense gun battle between the Joint task Force (JTF) and suspected members of the Boko Haram Islamic sect which occurred on Monday around 5:30 pm, running through the night. 24 hour curfew is only for Damaturu metropolis, as restriction of movement for other parts of the state still remains 10PM to 6AM while restriction of movement in Potiskum remains 6PM to 6AM daily. I weep for Nigeria. To imagine that this is no longer news. It's an every day occurrence now. Let's just go our own separate ways and know that there's no Nigeria anymore. All these killings are uncalled for. Even brothers quarrel and when they can't live together anymore, they go their own separate ways. The more we remain 'Nigeria', the more the massacre will continue. What difference will it make? Only the poor will suffer. I don't know why Southerners are still in the North. They should all go back home let them stay kill themselves. When they bring the war to our veranda, we will know how to deal with them.